I'm so glad you posted about this. And about sizes. My fingers are small too. I'm glad its light weight. Its so adorable. I like the price, too. Love love love this! ASOS is great! 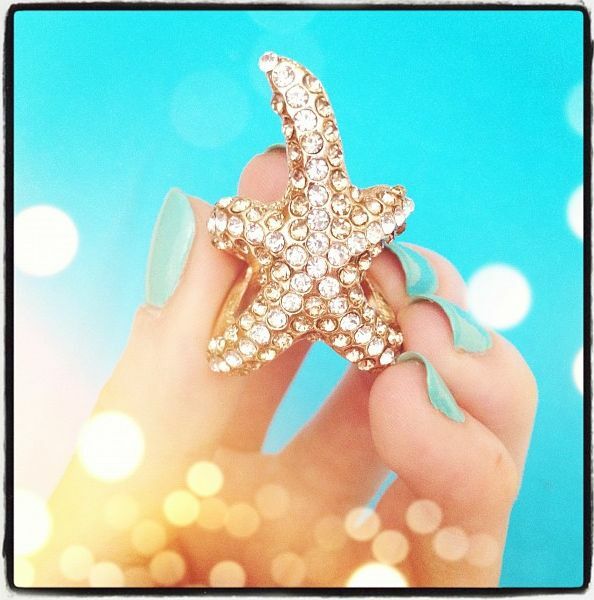 Love your studded starfish ring! It's such a great, bold accessory to add some bling to your look! It's an amazing ring at such a great price. So beautiful! It's something Ariel from the Little Mermaid would wear! So lovely!! ah, love it! :-) great purchase. I'm so glad you enjoy this! It's a cute ring. Such a lovely ring. Thanks for doing this! Just love the sparkles! Awesome! I love the photo you have of it. This is really a great summer ring. Love the ring! it's so great for the season! have a great start to ur week!! This is the most amazing ring I love it so much. That ring is absolutely stunning!! I love statement and large rings. I love that ring, it's so pretty! this is my favorite ring that you have. it's just so incredibly gorgeous! It really does pop everytime I see it! No wonder to me that I'm not the only one asking about it. Oh my gosh, that's so adorable! !